Even if we had danced round in circles, naked, while wha-whaing to the Indian rain-god, we couldn't have asked for crappier weather. Between Arnhem and Prüm, we have been bombarded with bouts of rain resulting in us spending half of our journey time reading the not so intelligent graffiti in bus shelters. Before this trip, these such storms would have had us turning around and going back home to try again, when the weather was a little better. Now our home is our tent. Need I say more? Besides our first night in Grietherort - Germany (57km; 83m), the next few campsites, including Arcen (49km; 117m) and Lövenich (77km; 311m) are viewed from the inside of our new home. But that's not all bad because it has given Ali and I quite a number of hours in very close proximity. Time to catch up with one and other after the hectic, stressful and emotional last few months in the Netherlands. We still keep trying to get used to the fact we will be on the road for the next five years. And although we have no problem telling every curious bystander this, it still hasn't really sunk in. While we've been following our noses, zigzagging our way across the Dutch, German and Belgium borders, we have noticed that, contrary to popular belief, the German bike paths are really fantastic. Well-maintained and signposted so that even an idiot with absolutely no sense of direction could find their way around. The nature reserves are also quite spectacular with ample place to rest and enjoy the beautiful surroundings and wildlife. 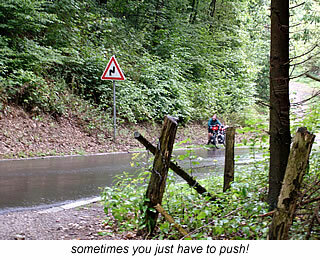 A definite must and if you like a bit of a challenge, then get off the paths and take the roads into town. Just try the climb into Nideggen (56km; 337m): doesn't matter which way! Beware though of some of the climb-percentages that are shown on the signposts though: as we quickly found out, they are only an average. On our way to Monschau (53m; 681m) we were constantly warned of a 9% climb. So with every kilometer, we were psyching ourselves up for the long steep ascend into town. This actually turned out to be a 15% climb over 2 kilometers. Even Ali got off his bike and pushed and that is something! Probably had more to do with the fact that it was raining cats and dogs at the time too. To make matters worse, Monschau turned out to be one of those places we could have easily missed. That is, unless you like walking along shop-lined cobble-stoned streets and ordering bitterballen when you get a little peckish. Another snag in the route was that around Mönchen Gladbach, there were absolutely no campsites to be found anywhere. We stopped and asked at the very helpful council house in Erkelenz since we sighted no tourist info point at all in this region. The best they could do was come up with a list of hotels. So, we kept cycling through the Lövenich area, until another thunderstorm threatened us enough to ask at the nearest farm if we could pitch our tent in one of their fields. Thanks to a lovely farmer's wife, we ended up camping in one of the most beautiful campsites we've ever been in: including a wild berry garden at our disposal. We've also taken to dumping luggage as we go. Mainly because the bikes are heavier than we expected. Several storage containers, clothing, electrical cords and our stingray mudguards have found there way into various camping sites' rubbish bins. And there'll be plenty more castoffs in the not too distant future I'm sure. That said however, today was the first day when it felt as if our belongings had all found their perfect spot in the bags and it seemed as if we were lighter than ever: still heavy, but now a little more manageable. The solar panel that Ali's carrying is drumming up quite an interest wherever we go. It's working like a gem by the way. Thanks Geert from Lenoir Solar. Today (05-08) is the first day that we could sit by the tent squeezing blades of green grass between our tootsies; absolutely glorious and what you would expect summer camping to be all about. We have stopped in Prüm (52km; 516m) for two day for a bit of bike maintenance and cleaning, especially after the wet gravel trails; to find an internet cafe; and just give the untrained legs (mainly my disorder) a rest. A curious farmer stopped his tractor to chat with us the other day and he promised that this coming week the weather would be hot. I like that forecast. Well, we didn't manage to find an internet cafe until today and then it is only a games hall; but beggars can't be choosers. So if you have been wondering why we haven't been so attentive with the updates: you now know. We certainly didn't expect it, but the simple truth of the matter is that everyone has a connection at home. In Verdun, the girl at the tourist information sent us to a neglected and what seemed like, by the piles of postage lining the glass entrance, a closed down place. The woman in the tourist information in Tonnerre almost laughed when we asked and probably felt sorry for us "poor internet-addicted folk" and let us check our mail there. We couldn't do any replying unfortunately. So thanks for all the mail and guest book entries and you'll just have to be patient for a reaction from us. I'm sure the more touristy area of the French Atlantic Coast will be better equipped. The sun is glorious in every sense of the word. You can walk to the amenities block in the campground in Echternacherbrück - Luxemburg (67km; 539m) without shoes on and the sand is dry and warm. I am so happy. It is short-lived, I'm afraid, because following that wonderful carefree afternoon-come-early evening by the tent, we are forced to go to bed early. The rains fault, I might add. And, when I say rain, I don't just mean little spitter-spatters; I mean torrents of the stuff! Ali doesn't seem to have as much of a problem with it as I do. I just don't like the combination of grey skies, non-stop wetness, wind gales and temperatures under the 13 degree Celsius point. Especially in Summer. Luckily though, after an overcast start to the journey to Esch sur Alzette (72km; 767m), the sun remembers that it was actually summer in this region and blesses us with his presence until we reach Verdun - France (81km; 702m) the following day. And although the landscape is mostly harvested fields and nothing to write home to mum about, it was a beautiful feeling cycling up and down the rolling hills with nothing but a blue horizon in front of you. The head winds do slow down the trip a little, but hey, the sun is out and that's all that matters. The promise of dry weather leaves our hopes as the greyness moves in during the late afternoon at Revigny-sur-Ornain (66km; 449m). 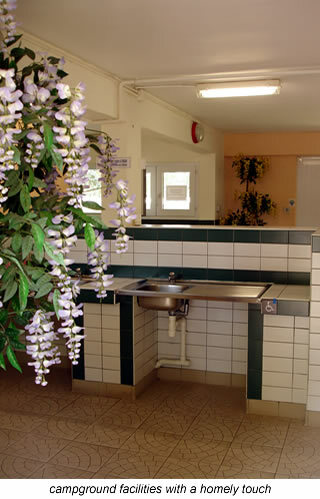 We try to leave the next day, but get as far as the toilet block. And while the heavens open up, Wim and Anneke make a deliciously, warm pot of real coffee which we graciously thank them for. As the rainstorm lessens, we set the saturated tent back up in exactly the same spot. Days seem to flow over into each other and the campsite owner in Dienville (80km; 236m) just told me the bakery isn't open. It must be Sunday. According to the computer, it is the 13th. Even after such a short period - it has only been two weeks - time is flying past us. And what a day, today! After unfortunately spending the last two days due to bad weather, at the Revigny-sur-Ornain campsite - very nice and simple, so, it deserves a mention - we decided we had to move on. After waking at six this morning and listening to the sound of rain pelting down on our tent, it finally stopped at around 8am. We swiftly packed and left for the 80km trip. It is extremely flat and we manage to clock 20km average per hour for the first 2.5 hours. Unfortunately, the rain starts up again; and the temperature drops to below 13 degrees. It is summer?? Of course this doesn't make Son very happy at all and after finding a campsite, she was just generally very annoyed and pissed off with everything and threw a few things around a bit. Everything is wet, dirty and as soon as something does manage to dry, it begins to rain again. We cook the second part of our very simple meal in the rain: Son is inside ready to unzip the tent at a moments notice; myself outside covered by my rain coat. We just manage to empty a bottle of red and Son decides to call it a day. It has been very wet, cold and exhausting and tomorrow we want to do another 80 or so kilometers. We desperately want to pedal out of this bad weather!! Hopefully we'll get to an internet place within the next few days as well: thanks guys for all your messages, as soon as we're able to get our hands on a fast connection, we'll be in touch. We are sitting outside our tent in Tonnerre (80km; 795m), sipping on a beer and getting this ready for uploading. If we can find an internet connection somewhere in the town, that is. There are lots of beautiful trees and grassland dotted with tents, campers and caravans. Ali has to constantly get up and move the, up until now, poorly used solar-panel so it gets maximum benefit of the sun's rays. There is heaps of space at this campground - maybe not after this rap - and you can hear the river running in the park next to us. The facilities are excellent and it's the hottest water we've had in a long time. Consequently, almost every piece of clothing we now own has been washed and is hanging out to dry. All our bags, tent and other possessions have also been given the wipe over. It's been a sort of spring-clean day. A most enjoyable and productive rest-day. The next couple of days take us through Cezy (65km; 89m); Chattilon-Coligny (52km; 472m); and finally into the heart of Orléans (89km; 311m). After all the huffing up and puffing down the amazingly beautiful wilderness and spontaneity of France, our legs are finally getting a bit of power in them. We are not travelling fast due to the rather strong head or side-winds; never seems to be a tailwind: why is that? And of course there is the state of some of the bike tracks to consider. We have resorted to referring to them as "Crocodile Dundee Terrain" since there are lots of potholes, mud and gravel, but well worth the adventure with the added bonus of no cars or trucks: only nature, wildlife and the occasional farmer or lock manager. The woman at the tourist bureau - yes, the sameone who almost laughed at us for asking for an internet cafe - confidently told us we could travel to Joingy, no problem, via the cycle path. It was actually 60 kilometres of dirt road and parts of it are now only open due to our recent expeditions. We make Cheverny (76km; 286m) by early afternoon. The following day is an easy ride into St.Martin-sur-Loire (64km; 214m). We are following the Loire at the moment with a bit of veering off to add variety to our lives. The bike paths are pretty good, but not always pathed. Not that that is a problem, but it does slow down the mileage per hour a bit. The castles in the area are amazingly grandiose and the place reeks of history. i won't go into that now, but if you want to know more take a look at this site. 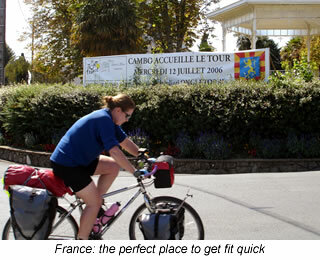 The trip from Saint Martin-sur-Loire to Montsoreau (77km; 106m) is a breeze. Mostly we pedal down well pathed roads, but sometime encounter a bit of dirt and cobble stones. We recommend the route alone for its bike friendly nature. The only thing to watch out for are the surrounding campsites: they are not always as bike friendly as the paths. You often have to pay for the site and not per tent and person. We are camping close to Angers in a really well-equipped, bike friendly and grassy campground at Les Ponts de Cé (63km; 244m). The decision to spend an extra day here is not difficult to make, besides we need to find an internet café and get a few more supplies. Yesterday, I broke a spoke for the first time in 12 years, so we got to try out Marten from M-gineering's Next Best Thing tool because, yes, you guessed right: the spoke was on the inside of the back wheel and the cassette needed to come off. We were most pleasantly surprised that it all went pretty smoothly so the bike maintenance course in Kiel-Winderweer has already paid off! I'm looking straight ahead at the inside of our tent. There are four small Ortlieb bags all in row, reflectors shining at me. Two pairs of shoes lie in front. On the left side the kitchen is set up with different coloured zipper bags laid out on empty Ortlieb stuff sacks. The tent is lined on one side with compression bags filled with Yeti pillows, sleeping bags and the more warmer clothing pieces ready for the coolness of the evening. Computer equipment at the back. Though the routine-forming ritual has been slowed-up by the dreary weather situation, it has only taken a few weeks, before a system has been set. That will obviously come with this site as well. At the moment it's a bit all over the place and we are still working out a uniformity for it. But hey, we've only been on the road for three and a half weeks. Still approximately two hundred and eighty two and a half to go. So, plenty of time for that. There is always something to do. When you have finished a days riding: setting up the tent, bike cleaning and maybe adjustments, showering, washing the clothes, shopping, working out the following days route and talking about it, cooking, washing up, collecting the dry washing, making the beds, relaxing with a coffee in the dim of an evenings light and finally sleeping -mostly like a log. My watch alarm is set for 6.50, 7.00 and 7.15am. 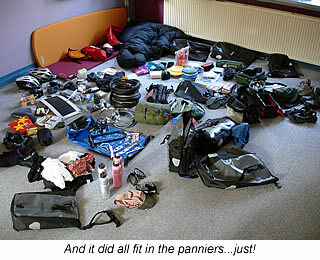 We normally rise somewhere between then and 7.30am, pack as much stuff as possible and fit it on the bikes. Getting the fresh baguettes - a luxury in Europe - is the next important task, followed promptly by preparing the breakfast - mostly of fresh fruit, cheese and bread and any other suitable goodies. This is all enjoyed with a cup of fresh filter coffee. We also pack our lunch for the way. Otherwise you're restricted to stopping when the French aren't having their lunch. Life ceases to exist between twelve and three and in some villages we have asked ourselves if anyone lives actually there at all. As soon as everything is packed and loaded on the bikes, we brush the teeth, make the last minute toilet stop; fill the water bottles and we're off. No matter how hard we try, the morning ritual never seems to be much shorter than two hours. Well, we'll be leaving France in a few days for a hopefully sunny Spain. Heading towards San Sebastian, Bilbao and then following the coast a little, we will drop into Leon before crossing into Portugal. We'll certainly miss the warm baguettes in the morning, delicious cheeses and animated folk but hey, we'll be back in about 10 weeks to pick up where we left off. This five day trip takes us through every type of landscape and weather pattern you could possibly imagine. From steep climbs around Pouzauges (95km; 919m) to the flattest, straightest, longest and most boring cycle path from Le Moutchic to Bordeaux. Yet again, the weather spoils some really beautiful and scenic spots. Still the locals keep promising us that sunny skies are just around the corner. I do hope so, because being constantly wet is absolutely no fun at all. In fact, by the time we reach Mauzé-sur-le-Mignon (86km; 577m), I'm more than jacked-off about it. From our resting place in Royan (93km; 424m) to Le Moutchic (93km; 234m), we hit coastline and I could have sworn I was in my old stomping ground at Triggs or Scarborough Beach in Perth, Western Australia. Long white sandy beaches go for as long as the eye can see with blue waters and white tipped waves: the perfect surf culture. It seems dangerous for swimming though and enough warning signs indicate this that must be done between the flags and while a life guard is present. The wind is up today and the sun trying his best to shine through. Temperatures are not high enough to tempt us into the water. In fact, it has to be well into the high twenties for me to even stick my big toe in. Anyway, almost at the end of this day's adventure, we are thinking about honouring the French with the "best cycle paths ever" medal, when we hit approximately 15 kilometres of 50cm wide, 1 metre long concrete slabs, dropped from the heavens above onto an extremely sandy surface. Whichever person came up with that bike path idea certainly had one to many cognacs the night before. In parts there were so many holes or should I say lack of reinforcement that our bottoms suffered for a day or two afterwards. Everything seems to be holding up pretty well and so far, we are satisfied with our choice of equipment. Of course breakdowns and repairs are par for the course. Ali snapped his front brake cable in the centre of Bordeaux a couple of days ago and before we made it to the campground just out of town in Gradignan (77km; 151m). Better then, than going down the side of a mountain. I've been trying to convince him to change his back cable as well, but Ali's motto is "if it aint broke, don't fix it"
What has been a bit of a problem though, is the stitching on the tent. When stretched tight the needle holes seem to be getting bigger and although not tearing, it does appears they might pull away altogether. Anyway, we've silicon-ed them up and are keeping a close eye on them. So far, all seems pretty good. Every time I come to France, the nature totally mesmerises me. There's always something going on, a new colour to enjoy, animal or insect to admire. The moment you sit down at the campsite it is likely that a beetle will land on your knee performing some strange robotic dance and sticking out his probiscus in a most provocative way before flying off to another resting ground to repeat the same ritual. Seconds later, a dragonfly will acrobatically perform entertaining stunts around you and your tent. Even while cycling, the side of the road can keep you adequately amused. If the untold different species of flowers and plant life do not capture your attention, then the vibrant shading of butterfly wings; the vermillion beetles marching purposefully across the road, a falcon hovering over a cowering white tailed hare or a deer running away from your presence, will. Well, it keeps me occupied for hours on end at least.